Liverpool may have their resolve tested as reports are again circulating that CSKA Moscow are to hit them with a £9 million bid for their murine (look that one up) midfielder Yossi Benayoun. CSKA are hoping to tempt Benayoun to the Russian league by offering him a financially generous and relatively short-term contract, after learning that the 29-year-old Israeli had spent last week discussing his future with his agent despite still having three years left to run on his current Anfield deal. Now, on the surface, £9 million for a 29-year-old that hardly plays seems like a no-brainer but you’ve got to ask: Can Liverpool really afford to let him go? With Albert Riera having talked his way into an early Anfield exit, Liverpool’s options on the left are hardly what you’d call bounteous. Fabio Aurelio is a decent enough option but you’d assume that he’ll come back into the left-back slot once he recovers from injury to replace the naive-at-best Emiliano Insua – which leaves the habitually patchy Ryan Babel as the only natural-ish left-sider in the current squad. 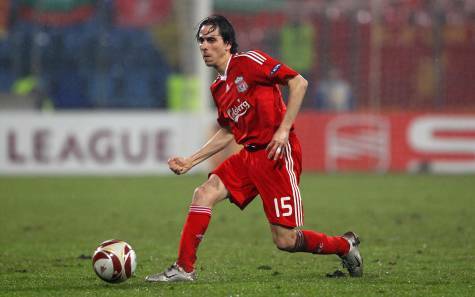 As far as I’m concerned (not very), Benayoun is one of Liverpool’s better midfielders. He offers genuine creativity and would be better suited to playing just off Fernando Torres than Steven Gerrard, allowing the skipper to play from the deeper positions that he used to relish. Benayoun also has versatility on his side, as he can adeptly fill in anywhere across the midfield, but that’s precisely the problem – he only ever seems to ‘fill in’. So it seems that Liverpool manager Rafa Benitez is left with two options here. Sell Benayoun (and Riera) and use the cash wisely to fund moves for a couple of exciting young wingers (Arda Turan/Georginio Wijanldum etc. ), or keep hold of The Yosster AND BLOODY PLAY HIM. Babel is a right winger who plays out of position in the left area and hardly can pass a defender and cross. Benayoun is exectly the same player and has the same problem, and scored his most memorable goals from the right. Riera is the only natural left winger but is not a premiership player. door number one is the one i’d go for. surely rafa’s intending to get at least one new left winger anyway, and in a year you’d never get that much for yossi. it more than covers the cost of wijanldum, who has already stated he would like to move to the club. sell him and buy chung-yong. Sell that ugly rat. He makes watching Liverppol a pitiful experience with his rat face and blind running down blind alleys. We need better players (and hopefully less ugly ones).